I've been fairly quiet for a few months as a result of a combination of a couple of months away at Staff College and being madly busy preparing for the arrival of my first child. However a few weeks ago I saw these rather brilliant miniatures from the Red Star Coven which I got through the Dice Bag Lady. They're sold under the banner of "Stunty Henchmen" which I presume to be a way of avoiding licensing issues etc. 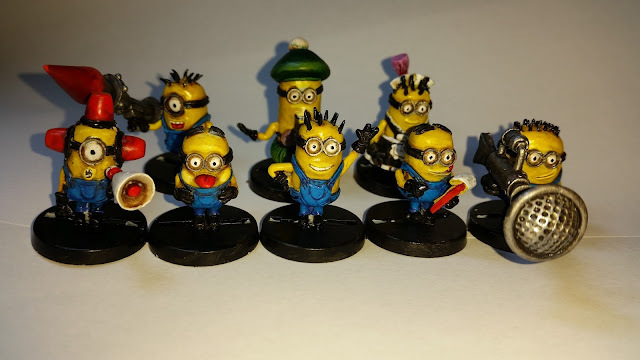 However I chose the paint them up as Minions from Despicable me. As soon as they arrived I was really impressed by the quality of both the sculpt and the casting, hardly any clean up was required which is rather unusual for resin in my experience. They're a complete nightmare for me to paint, I struggle with large flat areas and in 30 years of painting I have yet to find a really strong yellow paint. I wanted the colours to be bright so started with a white undercoat, well actually I started with about 2 hours searching for my white spray as I'd not used it in years! I thought that the cartoon nature of these miniatures would represent a little bit of a change from the rather somber colours of Saga and various other projects that I've had on the go in recent months. I'm reasonably happy with the results all things considered. Unfortunately I'm still waiting for their proper bases to arrive. I've ordered some industrial scenic resin bases that I think will add to the miniatures by setting the scene more into the underground lair. Until then they're stuck on standard slot bases. All up a rather fun Saturday evening whilst Memsahib is away at her Mothers.